HUNTX3, a new all-digital hunting magazine, launched this week. You’ll find a full-featured website at HuntX3.com. There you can access gear reviews, videos, news feeds, and popular articles. But that’s just the beginning. The “heart” of HUNTX3 is a flash-based, interactive e-Zine that displays like a conventional print magazine with “double-truck” layouts, flip-page navigation, and full-page ads. The e-Zine even has embedded video and audio — and all content is FREE. As a rule, we generally don’t favor these print-magazine mimicking formats. They take a long time to load, and seem less reader-friendly than conventional web pages. On the other hand, HUNTX3’s e-Zine layout allows for large photos, and impressive two-page spreads. 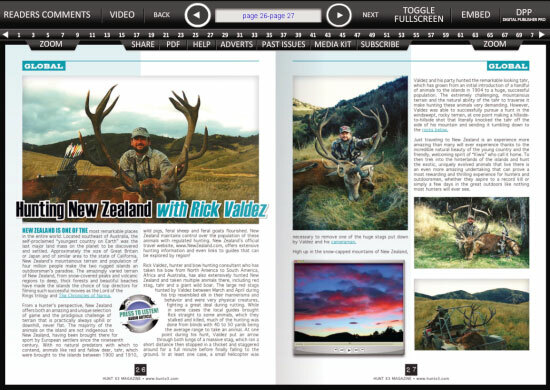 The premier issue of HUNTX3 Digital Magazine features many articles of interest for bow-hunters and big game hunters. There are excellent stories about elk hunting in Utah, Red Stag hunting in New Zealand, and Dall Sheep hunting in the Canadian Yukon. 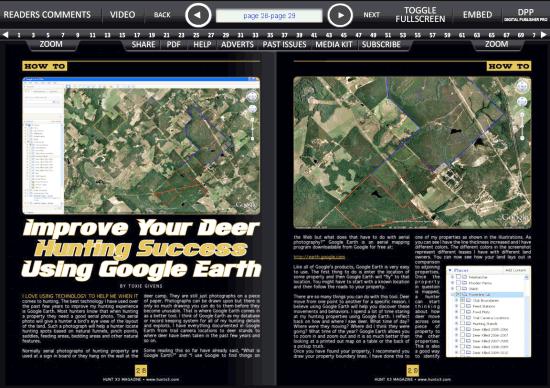 HUNTX3’s premier issue also includes a fascinating article by Toxie Givens explaining how to use Google Earth satellite photos to monitor game stands and plan a deer hunt. The article shows how you can define club boundaries, and plot the location of feeding stations, deer stands, and trail cameras. Using Google Earth, you can even mark locations where game has been taken in the past, link trail cam photos, and superimpose current weather conditions. Share the post "HUNTX3 — New Digital Hunting Magazine Debuts on Web"
Speaking of Leupold scopes, Midsouth Shooters Supply is running a big sale on genuine Leupold scopes, 2008 modelsr. A wide selection of these 2008-vintage Leupolds are discounted 30%. Note: These are new, full-warrantied scopes, not factory refurb or “blemished” models. All 2008 close-outs are being sold at 30% off to make room for the 2010 inventory. Share the post "30% Off Older Model Leupold Riflescopes"